MegaLED’s modular system enables customisation of a control system to suit individual LED fixture types (both powerLEDs or voltage driven leds) and their Light control requirements. The modular system splits into 2 distinct sections: Control & Output. ‘daisy-chained’ to give virtually limitless output drive capacity for all types of LED fixtures. AM2 is a modular RGB Output Controller popular with both sign makers as a sign controller and LED home installations:- The AM2 can also be installed into a double UK wall-plate.. Various RGB programmes are available. AM3: 0-10V is a 3-channel RGB modular controller board designed to accept 3x 0-10V analog inputs to set digital dimming output levels to drive any of our modular LED Driver “output” cards. 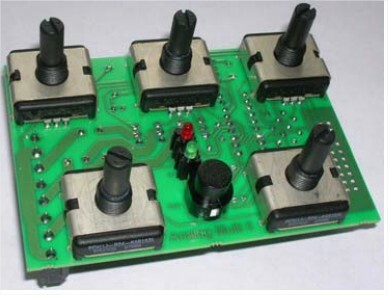 Analog Multi Function LED Controller is a 2-input 0-10V, 2 channel output controller board that features several ways to have lighting programs, called up and controlled through its two 0-10V inputs. 6 channel modular DMX decoder. VDRIVER LED VOLTAGE DRIVER CARD 0-24V LED FIXTURES 3ch. V-Driver is a 3-channel, modular voltage output board with high current output capacity (15A). Drives voltage-LED RGB Fixtures, 0-24V. Common anode leds, common cathode also available. 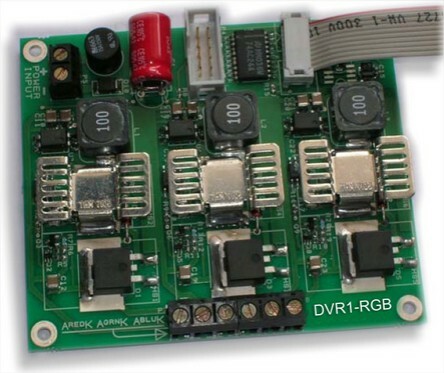 350-1000mA PowerLED Driver RGB 3ch DVR1-RGB is a 3 Channel (RGB) modular output driver board for power LEDs: 1, 3 and 5 Watt devices. These driver boards form a system, accepting signals from our modular control cards, which include: AM2 & AM3. Modular controller & decoders when used with our output driving cards are used to build flexible, expansive lighting systems. Our modular led control system can be used to drive limitless high ampage led loads; constant voltage 12/24v led fixtures and constant current power-leds. Modular LED Driver cards for voltage and current driven leds.